The other day I was going through some old photos and found these taken several years ago from the Eastern Shore. We were at one of our favorite places to almost catch the tent on fire when a horrific storm whips up the embers from the campfire in the middle of the night to camp, Cherrystone, just north of Cape Charles. We're still suffering through cold weather here, and focusing on these helps remind me that warmer weather can't be that far away. Can it? The weekend will be a mixed bag of activities. Friday after work I will drive from Williamsburg to Northumberland for Daughter's soccer game, assuming there is no snow or rain, and there better not be. Saturday, if it is warm enough, I have tons of yard work to do. I don't want to talk about it, I'm so far behind due to the cold weather, snow and rain. Sunday Baby Sis will be coming home for an Easter food fest that my mother and I will prepare. Meanwhile, Son is traveling by himself (via train) to his paternal grandparents in New Jersey to kick off the first half of his spring break. One of the days will include a trip into NYC to tour the United Nations, among other fascinating activities. CBW racing all over Kingdom Come after work for daughter's soccer game. Daughter relaxing at home, enjoying her spring break, visiting with friends. Son touring the United Nations. Yep, that sounds about right for this family. Hope your weekend is a great one. Happy Easter. If you look closely, there's a faded cross on the front of this boathouse. These pictures were taken from the dock at the Tides Inn in Irvington. The Tides Inn is a rather swanky resort and marina that for many years offered sunset cocktail cruises and dinner cruises aboard their very own boat, the Miss Ann. There is nothing swanky about these photos or what they highlight. However, as I stood on the grounds of the resort admiring everything so perfectly in place, not a stray stick or errant leaf to be found, I felt myself drawn to this adjacent property, visible from the dock. Thanks to my camera's zoom I was able to get a better look at the old house so close to the immaculate grounds of the resort. Speaking of beauty, the Miss Ann is legendary around here. A former Mathews resident who is an artist, gifted writer, college professor, brother of commenter Mathews Mark, and good friend to the Chesapeake Bay family wrote a beautiful ode to the Miss Ann several years ago that I published on this blog. Click here for that post, which includes a poem. p.s. The author was also my former high school track coach. Without his expert guidance on form and technique for hurdling, high jump and long jump, I'd have just been another washed up forgotten memory. The sign in the first photo is leaning against the bottom of this little building. I think I could fill a second blog with nothing but pictures of boats on dry land. These are a few more shots from Saturday's pit stop at the house that was for sale. Saturday was sunny as opposed to Sunday's snow which is now Monday's rain. My daughter's soccer season began over a month ago, and thanks to Mother Nature she's only had two games thus far. The daffodils are sagging, slunched over in the field. Yes, that's right, slunched. Slunched is what happens when your brain merges hunched over with slumped. Slunched. Go ahead and use it freely today, and tell 'em CBW said it was OK. Thanks to all of March's rain and cold weather, I've not been running to prepare for April's half-marathon. I'll probably end up slunched over having to walk it, which will make me angry. I don't care about the speed, my only goal is to avoid slunching walking. My only consolation is Baby Sis, who is doing this with me, says she's done next to nothing to prepare either. Please leave the cold and rain behind with March so I can emerge from the winter funk that causes my brain to create and use words such as slunch. I really need some sunshine, Vitamin D, fresh air and exercise. Once upon a weekend, the weather was wonderful. I'd never know if not for this blog: Big Hair Envy and Thomas B. The afternoon included laughing, talking, philosophizing, and laughing. It was pretty clear that spring had finally sprung. These daffodils live at the Tides Inn over in Irvington. I took their portrait after lunch on Saturday. we drove over to Irvington and then to Kilmarnock. On the way home, a place I've admired for some time was sporting a For Sale sign out front. The setting sun pretty much beckoned us to stop and trespass take some pictures. some sunshine, and just the slightest sprinkle of spontaneity. Mother Nature begged to differ these past few days. and brutally cold (although it doesn't necessarily appear so in these pictures). The wind was blowing so hard my car shook when I parked here. They say it's supposed to be sunny and in the fifties on Saturday. May your weekend be filled with sunshine and mild temperatures. Twas the night before Wednesday and all through the town, not a thing appeared different, businesses still looked shut down. Country Casuals, a clothing store, has been there since I was a kid. ...When what to my wondering eyes should appear, but a miniature sign and seven tiny words so dear. could bring Mexican to Mathews. There's a Mexican restaurant in Mathews! Christmas has arrived early this year. Downtown Mathews has a Mexican restaurant. Do I hear locusts zombies approaching? Although many people wouldn't bat an eye at the opening of a new Mexican restaurant in their town, for Mathews residents required to drive a minimum of 15-20 miles for carne asada or tacos al pastor or margaritas fajitas de camarones, this is indeed good news. Mi Casa Azteca is in the building that I will always call Fleets, since a restaurant by that name flourished there for many, many years. The Chesapeake Bay Family intends to try this only best Mexican restaurant soon, this week if possible. And CBW maintains her ardent yet futile hope that one day there might even be a Thai or Vietnamese restaurant within the county lines. She may be delusional, but who could have imagined a Mexican restaurant in town? Happy dining to all and to all a savory bite. 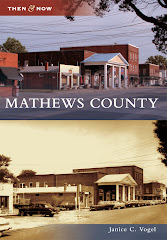 Labels: Mathews Court House, New Mexican Restaurant, Now What?, What's Next? OK, so clearly I'm getting a little carried away with this newfound ability to post larger pictures. I promise to get things under control soon. These were taken from the docks at Merroir a week or so ago. I'm guessing the owner of this boat is a character. A very clever character. Yesterday I tinkered with the template of my blog, so if it looks different that is why. It may change again, who knows. However, based on my ardent aversion to change of any sort, I doubt much will happen for the next ten years until there is an absolute requirement to do so. Speaking to fear of change, this weekend my son, watching me hiss and spit at the frustration that comes with trying to tap out a text message on my circa 2004 flip phone, asked, "Mom. Why?" The implied rest of that sentence has to do with why in the world I'm still using the abacus of the cell phone world when calculators are a dime a dozen. I don't have an acceptable answer to that question. If the phone breaks, I will be forced to get a new one. Until then, I am too scared ridiculous to upgrade to a new/better one. However, my one and only goal for 2013 was to upgrade, so I need to reconsider my stance on this topic. Anyway, the fact that I did change the blog template is really something and is the result of the comments on Friday's post about how I could have bigger photos if I only made this simple change. Next is a confession. These photos are from 2011 and 2012, because I had no time to take new photos over the weekend. Plus it was raining most of the time. Plus I was gone most of the weekend. Plus I am still trying to recover from it all. There is quite a story to tell from Saturday involving four members of the Chesapeake Bay Family and their struggle to arrive at and survive a basketball tournament in another part of the state the upper reaches of the Northern Neck. However, that story requires more time and attention than I have to spend as I write this, so I'll save it for later in the week. The title should be A Comedy of Errors, which not coincidentally could also be the story of my life title of my biography. Also, yes, I'm still talking about basketball even though the end of season banquet has come and gone and I'm now focused on my daughter's mad soccer skills. It's all part of the story. My mother could also write a blog post with her version of the day's events. If she hasn't written one already I might ask her to do so and we can compare notes. Until then, have a great week. p.s. I think this new format is too wide, so I'll be fixing that soon. A mere five years after starting this blog, I have learned something new. These photos have been "embiggened" as my blog tutor and expert New York City tour guide Daryl would say. Others might use the boring word enlarged. The point is, I've never known how to make the photos larger than the three options Blogger defaults to. Now, thanks to Daryl, I know how to change the width and height. Wait. I've been doing this for five years? than the five years that raced by while I was doing this blog.